I mean, first up, how’s the lip? Yeah it’s good, it’s healing well, it’s not perfect but it’s getting there and it’s good. It was quite a nasty injury to look at but, aside from that, was there any lasting damage? No, well obviously, I haven’t sparred on it yet so I’m not too sure what it’s like to take a shot on it yet but I’ve been back in the gym since – went straight back – and I can still punch bags, do footwork but it’s just, obviously, no contact and I won’t have any contact on it for the next month or so. I’m giving it the time for it to really knit back together. Like you say it’ll be a month until you get sparring, when realistically can we see you back in the ring? I definitely want to be back out as soon as possible, everything kicks back off in October time so if I start a serious camp through September – I’m going to be in half-decent shape, anyway, I’ll be in the gym over summer – I want to be back out in October. Would you be looking to go straight in with a big fight like the Tetley rematch or one fight to get everything out of your system? I really wouldn’t mind – I want the rematch with Tetley and, as I’ve said, I’m staying in the gym so I’ll be sharp and if they offer me a warm up fight then I’ll take it because there’s no harm in getting in there and shaking the cobwebs off but, equally, if they offered me Tetley then I’d jump at the chance. And the fight itself was really good – UNTIL it was stopped, how did you feel it was going? I knew I was winning. I knew I was winning. Even after watching the fight again, I think the first four rounds I won easy – I give the fifth round to Tetley – the sixth round was quite even but the seventh round I had a massive round and I couldn’t miss him and then he couldn’t miss me in the eighth round! So that was a good round for him but I thought the ninth, up until the cut, I thought I got the best of those exchanges. I was confident, my corner was confident, we knew I was up and even in some of the rounds were he was throwing a fair few shots, none of them were landing, I was moving my head and they can’t award non-scoring shots, can they? I knew that, myself, I was winning. He was your best opponent, do you find that better opponents make you perform better? Yeah, definitely, I said this throughout the camp in interviews that Darren was adamant that he was the better boxer and I was just a brawler; the reason I have, maybe, brawled in previous fights, is because I didn’t have the calibre of opponent in front of me to make me box and I could just get away with getting stuck in there to dust them up. I knew I was having my own way but, like I said, I have some world class sparring – Jack Catterall, Liam Smith, and I can’t just spar really good opponents and have a tear up with them. So I do practice and hone my boxing ability and, now, for those that didn’t know, I CAN box because I was out-boxing Tetley and keeping him on the end of my jab, not letting him in, using my feet. I’m happy I was able to show people that. Do you think he will want the rematch? I hope that he is going to want it for himself because if I knew I was losing a fight but ended up getting the decision via an injury stoppage I think I would want to prove to myself that I could beat the person outright but, obviously, it’s a business and he’ll do whatever his team advise him to do. He’ll listen to his team and I, personally, think they’ll advise him not to take it; if I come back in another fight, with him, I’ll be better and I’ll be sharper. It’s the type of person I am. You turned pro at 22 – it’s quite early – was that always the plan? Yeah I wanted to be a boxer my whole life, even through the amateurs. I’ll be honest when I say I messed about a little bit through the amateurs when I was l between the ages of 13 and 16 – I was boxing because I loved boxing but I was still being a teenager at the time. When I got to 17, 18, 19, I thought, “do you know what, I’m going to give this a good go because I wouldn’t mind doing it for the rest of my life”. At the age of 18 I had a torn labrum and I had an operation, two years out of the ring, I came back at 21 and wanted one more year before turning pro. And in that time out was there ever a point where you thought about packing it all in? … By that point I had already told myself that being a boxer is what I was going to do and I’m the sort of person that once I say something, I’m doing it and I’m doing it with every bit of ambition. I’ve got a little bit of, like, OCD so when I’m doing something or I tell myself I’m going to do it then I do it properly. I can’t cut corners or anything like that, I can’t cheat, I have to do it so I’m fully committed and accomplished. I’ve seen you say before that you want to win the British belt, is that still the immediate target? Yeah, of course, I’d be sitting here lying if I said I didn’t want to win a world title but I’m realistic with my ambitions – the world title is the crème de la crème – and I’ll get there in time but I want to prove myself at British level first. And obviously there’s other class domestic fighters which will produce incredible fights so that’s what I’ll chase first of all, take it step by step, keep working hard and hopefully the dream of becoming world champion will come true. In the last three and a half years, then, what is the most important thing that you have learnt about boxing and about yourself? That I can overcome anything, mentally. I have the strongest mental power anyone has ever seen – and that’s according to over people. If I’m doing something, if I say I’m doing something then I don’t care how I’m getting there but I WILL get there. Any situation possible, I will do it. Obviously as a boxer you need to be good but how important is it to be mentally strong, too? Of course because at some point in every boxers career you will get hurt. You will get caught with a shot, whether it’s to the head, to the body, whether it’s a cut. 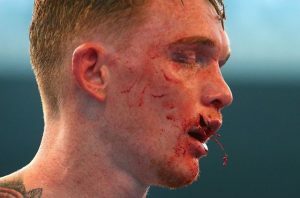 You will get hurt but you can’t give up and we’ve seen many boxers, over the years, spew it and just pack it in. I could name you 10 boxers who have done it in the last year – I’m not going to because I don’t want to slag anyone off – but I will never quit. I will never, never, ever, ever quit. Obviously you’re signed to Frank Warren, how big is it for you to be able to fight on TV shows? Well I always do well on ticket sales – 200, 300 people always coming and that’s really good for me because it means vocal support and obviously boxing is about putting bums on seats and before the Tetley fight not many people had seen me, or knew about me, unless, of course, they had been to one of my shows but all them people who had gone to see me in a fight would message me saying how impressed they were and after this fight I’ve probably had about 2,000 people say on Twitter and everything that they enjoy my style and can’t wait to see me box again. For me that’s humbling because that’s my goal, I want people to see me fight and think “wow, this guy can fight”. How people feel when they watched Miguel Cotto, inside fighters who get to work and always keep watching. From a style point of view it is everything that fans want, does a set style add extra pressure? I just go out and do my thing and if anything I perform even better under pressure because it adds the extra edge to me. Looking at the 12-18 months, what can we expect? We looking at titles, building the profile? Either, or. I’ve got no set plan, I’ll just take down what’s in front of me. If I got offered the British title I’d take it, if I got offered the Tetley rematch I’d take it. There isn’t anyone I wouldn’t fight, I’m not here to avoid people, I want to test myself and show everyone how good I am. When people here my name I want them to say, “yes, he’s a guy to watch”. 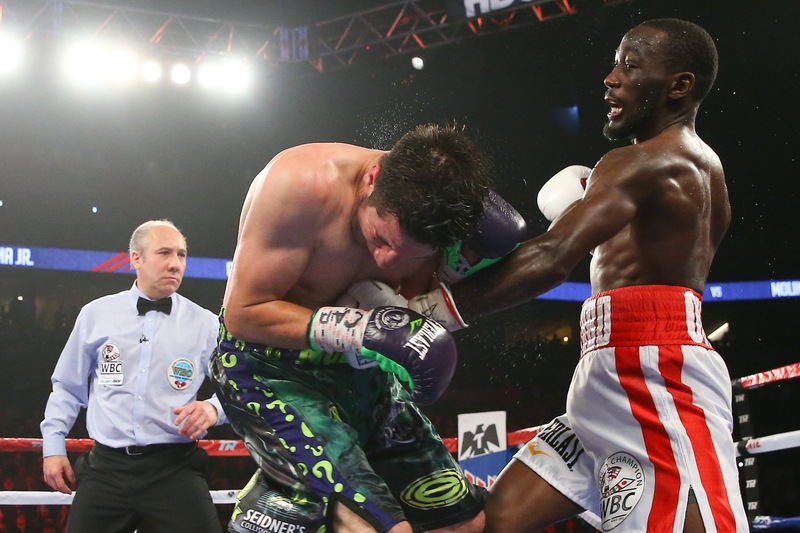 If Terrence Crawford rang you up later today and offered the fight, would you take it? If the money was right, yes. If the money was right. 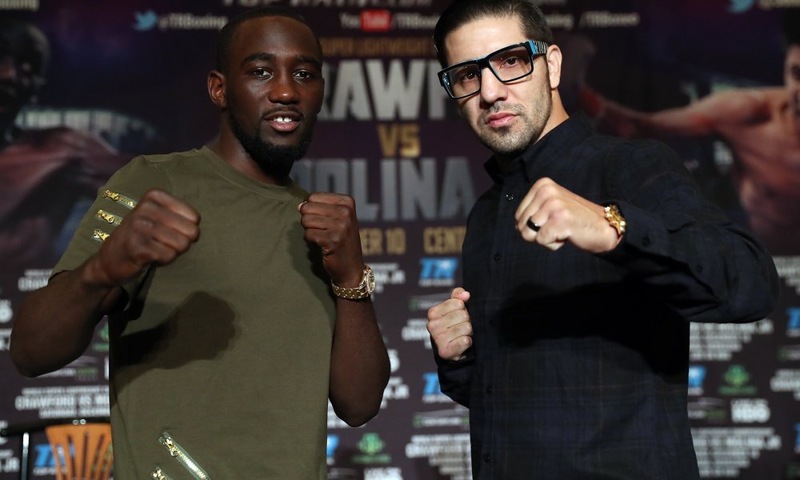 The main event involves the Pride of Omaha, former fighter of the year and current pound for pound lister, Terence Crawford(29-0) againstheavy hitting John Molina Jr. (29-6). Molina,unfortunately, did not make the 140lb limit and will no longer be able to win Crawfords WBC/WBO/Ring titles. Both fighters put in a lot of heavy work early in the fight. Beltran fighting for the second time at the Century Link, his first being a decision loss to the champion, Terence Crawford. Neither guy knows how to fight going backwards and are looking to punish their opponent. Beltran who has been in the ring with the likes of Lundy, Kim, Burns and was the former sparring partner of Manny Pacquiao, was not taking this fight lightly, coming out with a very intense style. Menard, who is a fighter that is normally able to confuse and counter his opponents well, has been set to follow Beltran and cover up against the veteran Beltrans hard shots. Menard was able to land some tough punches in the early rounds and did earn some respect from Beltrans chin. heavy hands. Beltran may have a slight lead, but Menard is definitely not backing down. Beltran very much was the aggressor and used certain veteran techniques to make this a very very tough and uncomfortable fight. Midway through the fight Beltran was making it apparent that he was in control and would not leave Omaha as a loser again. Menard showed heart, taking on a fighter with much more experience and power. added his name to the list of top Lightweight Contenders. to the ring as the Lineal and Unified Jr. Welterweight champion in front of his hometown, he started off quickly, sharp and could see the wounded opponent in front of him immediately. Crawford landed a few big shots early then made Molina follow him around the ring , letting Molina run into a straight right. Molina’s only chance from the first round would be a lucky punch. Crawford was just too sharp. but also got carved up by the technician that is Bud Crawford. rarely covered up. Crawford was able to work easy as a southpaw, which he switched to one minute into the first round, and picked Molina apart. looking in any type of trouble. Crawford will throw his name into the mix for this years fighter of the year and retain his place on the pound for pound list. Is a showdown with the living legend Pacquiao next, we’ll see. On Saturday night HBO and Top Rank Promotions will team up to televise three bouts from two different locations. Terence Crawford will defend his WBO and WBC Junior Welterweight titles in the main event of the evening against John Molina live from Omaha, Nebraska. Additionally, lightweight contender Raymundo Beltran will compete against rising prospect Mason Menard as the co-main event of the Nebraska card. It was also recently announced that Top Rank will promote Joseph Parker in the United States; and HBO has decided to show the WBO Heavyweight Title Bout between Parker and Ruiz on a same day tape delay from Auckland, New Zealand. Joseph Parker will be fighting in his hometown of Auckland, New Zealand and will be the favorite coming into this bout. He has already fought four times in 2016, and four of his past five fights have been by TKO/KO. He is twenty four years old and is three years younger than his opponent. He will also have a two inch height advantage and a two inch reach advantage on Ruiz. Ruiz has also been fairly active and has fought three times in 2016. Joseph Parker has the heavier hands of the two boxers. He has stopped eighteen of his opponents, and four of his past five fights have ended by TKO/KO. Ruiz has stopped nineteen of his opponents, but only two of his past five opponents failed to go the distance. They both have had moderate success as an amateur. Ruiz was a Mexican National Amateur Champion and Parker medaled in several international competitions as an amateur. Parker has a slight edge in quality of opposition. He has defeated the likes of Alexander Dimitrenko, Carlos Takam, and Bowie Tupou. Ruiz has defeated the likes of an aged Ray Austin and Siarhei Liakhovich. Ruiz is a good enough of a boxer to last all twelve rounds, but it will be extremely difficult for him to pull out a victory in Parker’s home country of New Zealand. The opening bout of the night in Omaha, Nebraska will be between Ray Beltran and Mason Menard in the lightweight division. Beltran is a former sparring partner of Manny Pacquiao and is a rugged, tough, durable opponent. He’s much better than his record suggests and is known for having excellent stamina. However, Beltran is thirty five years old and will be seven years older than his opponent, Mason Menard. Beltran will have about a two inch height advantage and a one inch reach advantage. Menard does have a slight edge in power. He has twenty four knockouts on his record while Beltran only has nineteen. Menard became well known with some upset victories on national television, including wins over Bahodir Mamadjonov and Eudy Bernardo. But prior to those wins he faced mainly non-descript opponents and most of his bouts were in his home state of Louisiana. Beltran has defeated the likes of Ivan Najera, Arash Usmanee, Ji-Hoon Kim, and Henry Lundy. He also has several losses, but most of them have come against good opposition. He has lost to the likes of Terence Crawford, Luis Ramos Jr., and Sharif Bogere. Neither boxer was very active in the past two years. They both fought twice in 2016 and once in 2015. Neither boxer experienced a great deal of success on the international stage as an amateur. Menard has surprised many with his two latest victories, but Beltran is a big step up in competition for him and isn’t past his prime yet. This should be a fight that Beltran wins through a hard fought decision. Terence Crawford is one of Top Rank Promotions’ biggest stars and has been a rumored opponent for Manny Pacquiao in the future. Crawford regularly fights in Omaha and will have a nearly sold out venue cheering him on. He’s twenty nine years old and is in the middle of his athletic prime. He’s four years younger than Molina, but will be giving up about two and a half inches in height as well as an inch in reach. Crawford has been fairly active for a champion and fought twice in 2016 and twice in 2015. Molina has only fought once in 2016 and twice in 2015. Crawford has twenty stoppage victories and three of his past five fights did not go the distance. Molina has twenty three stoppage wins, but has gone 3-3 in his past six fights. Molina is always a dangerous fighter, and this was evident in his last upset victory over the hard hitting Provodnikov. He has also defeated the likes of Mickey Bey, Dannie Williams, and Henry Lundy. However, Molina also has an impressive list of opponents that he has lost to. These fighters include Antonio DeMarco, Andrey Klimov, Lucas Matthysse, Humberto Soto, and Adrien Broner. Crawford has never been defeated and has been slowly increasing the level of competition that he faces in the ring. He has defeated the likes of Viktor Postol, Henry Lundy, Dierry Jean, Thomas Dulorme, Raymondo Beltran, Yuriorkis Gamboa, Ricky Burns, and Andre Klimov. Crawford was also very successful as an amateur on the national level, and has even won a Police Athletic League Boxing Championship. This is a fight that very few expect Crawford to lose. He’s a more technically skilled boxer than the last man that Molina beat and should be able to stop Molina. Molina has been known for upsetting the apple cart from time to time, but Saturday is unlikely.